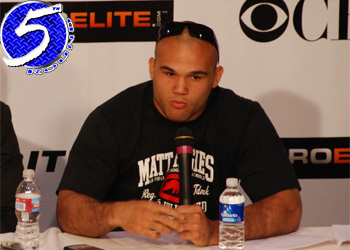 UFC president Dana White wasn’t joking this past Saturday when he claimed the promotion was working on a welterweight shootout between Robbie Lawler (pictured) and Rory MacDonald. Just three days after dropping the hint, the UFC confirmed Tuesday night the 170-pounders will collide at UFC 167. The November 16 event takes place inside MGM Grand Garden Arena in Las Vegas, Nevada. Lawler has been nothing short of spectacular since returning to the UFC two scraps ago. The 31-year-old not only beat former top contender Josh Koscheck and Bobby Voelker, but he did so in devastating fashion. MacDonald, who most believe is destined to be the UFC welterweight champion, has won five consecutive bouts. He posted a lopsided unanimous decision win over fellow up-and-comer Jake Ellenberger just last month. Depending upon how the rest of the roster rounds out, Lawler and MacDonald could very well co-headline the show.